At Texana, your business is our business, and we want nothing more than to help you succeed. We offer several types of loans to help you get started or grow your business. Run your business. Don’t let it run you. We work to know you. Access to credit is absolutely essential to running a business. Our financial professionals take the time to get to know your business, your circumstances, your budget—in short, you. Together, we work to find the perfect loan solution for you. Our goal is to be the bank that helps you succeed. With more than 100 years of banking experience under our belts, we’ll help you grow fast and grow well, too. Do you have access to the capital you need? Your bank in your pocket. 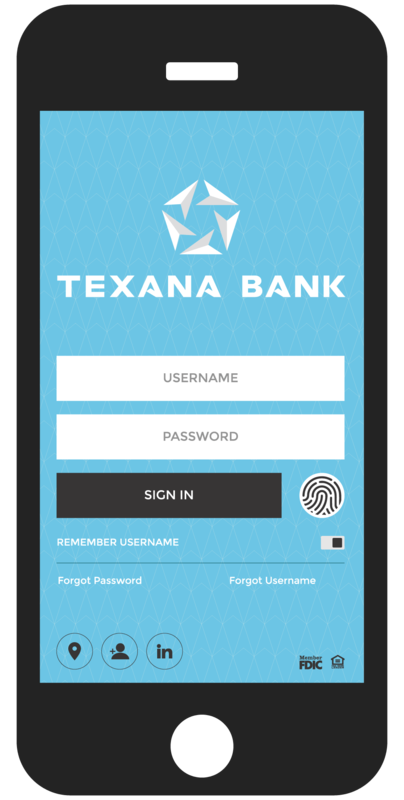 When you have the Texana Bank app, you have the capability to access your account information any time, anywhere. Just download to your smartphone, and get started banking at your convenience. At Texana, we believe banking should be simple. Keep track of every dollar you spend on your computer, tablet, or mobile device. Using our app is easy, secure, and hassle-free. NEED A CHECKING ACCOUNT FOR YOUR BUSINESS? We can help. Texana Bank can help your business conveniently save money, maximize profits and increase efficiency. Successful operations require an uninterrupted supply of capital. That's where we come in to help. Manage your business capital, payment processes and more with our treasury management solutions. Make important purchases for your business quicker and easier. Go with Texana Bank’s business credit card. We can help eliminate the guesswork and stress from starting your business. We offer a wide variety of business lending solutions and Treasury Management services designed to help improve cash flow, increase efficiency and combat fraud.